The world is facing a 'youth bulge' with 10-24 year olds accounting for one third of the population in low- and middle-income countries. “Adolescence is a time of huge opportunity - it’s a developmental stage in which investments can bring about substantial improvements in health and wellbeing across the life-course,” - Dr Peter Azzopardi, Co-Head Global Adolescent Health Group. In some low- and middle-income countries more than a third of the total population is a ‘young person’- aged 10-24 years. The rapid improvements in child health and survival in many countries have not been matched by improvements in the health of adolescents and young adults. 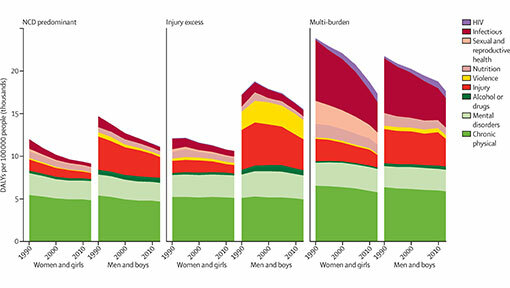 At the same time as the burden of infectious disease is declining, non-communicable diseases including injuries, mental health, cardiovascular and cerebrovascular disease, diabetes and obesity are increasing dramatically. These conditions commonly have their origins in childhood and adolescence. Adolescent health profiles differ greatly between countries and within nation states. Just over half of adolescents grow up in multi-burden countries, characterised by high levels of diseases of poverty (HIV and other infectious diseases, undernutrition, and poor sexual and reproductive health), injury and violence, and non-communicable diseases (NCDs). “Most of the world’s adolescents grow up in countries burdened by high rates of infectious diseases including HIV, as well as under-nutrition, adolescent pregnancy, poor maternal and child health, and poor access to essential sexual and reproductive health services.” - Dr Elissa Kennedy, Co-Head Global Adolescent Health Group. Burnet’s Dr Peter Azzopardi and Dr Elissa Kennedy both contributed to the landmark report Our future: a Lancet commission on adolescent health and wellbeing released in 2016. Investments in adolescent health and wellbeing bring a triple dividend of benefits now, into future adult life, and for the next generation of children. Inequities, including those linked to poverty and gender, shape all aspects of adolescent health and wellbeing. Tackling preventable and treatable adolescent health problems including infectious diseases, undernutrition, HIV, sexual and reproductive health, injury, and violence will bring huge social and economic benefits. This is key to bringing a grand global convergence in health in all countries by 2030. Establishing systems for the training, mentoring, and participation of youth health advocates has the potential to transform traditional models of health-care delivery to create adolescent-responsive health systems. A landmark Burnet-led study reveals the world’s adolescents are encountering greater health challenges. Burnet Institute is collaborating with Papua New Guinea’s National Department of Health to improve health evidence, services and outcomes in PNG.